If you are going to quote something in normal writing you place speech marks (double quotes) around it. That is also fine on the Web. However, if you want to style the text in a way to show that it is a quotation you can put tags around it. The two quotations may look slightly different depending on your browser. The big difference though is that you can use the q element and CSS to make all quotations look slightly different in terms of colour, font or other styling. Note that q is for in-line quotations which are normally just a few words inside a paragraph. Depending on your browser the quote should look a little different from normal paragraphs. 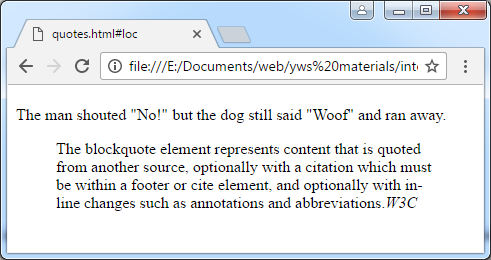 The cite attribute in the code above provides a URL where the quote comes from but is not intended for the user. It allows the browser and search engines to know where the quote came from. You could also make the citation a link if you want the user to be able to go to the original page.